Mobile (Tented) Safaris with African Encounter – the only truly traditional safari style. The luxury mobile safari was conceptualized and borne in Kenya many years ago. This traditional safari style has since spread to many different parts of east and southern Africa and describes any mobile camp where the entire camp is is dismantled by a crew of staff and moved to the next location ahead of the guests, ready for their arrival. Staff include a camp cook, waiter and tent crew and the sites are chosen for their exclusivity and location. Standards of tented accommodation do vary but in essence this really is luxury camping with good beds, linen and en suite bathroom (in most cases). You have the same guide (and camp staff) throughout which is also a great concept and with your very own staff compliment things soon become friendly and intimate. Highly recommended, this is probably the most exciting way to do a safari in Africa and the genuine African safari adventure! If budget is not your only criteria, and you have an adventurous spirit, this is the ideal type of safari to book. Each itinerary is tailor-made with regard to which areas are visited and are generally 7-14 days in length. This example Mobile Safari departs on a regular scheduled basis to some of the most beautiful wilderness regions of Botswana utilising classic African style (serviced) tented accommodation with your comfort in mind. These safari adventures offer a great diversity of wildlife and landscapes, utilising private exclusive camping sites in National Parks and on private concessions. A journey to Africa is often life changing for our guests. We know that the most extraordinary way to truly experience Africa is by venturing into pristine, less-travelled areas. All our Mobile Safaris are hosted by a professional, knowledgeable guide who shares a wealth of information gleaned from close interaction with the wildlife and ecology of the regions. Evenings are spent around a blazing camp fire, a parabola of stars above. Hearty, delicious bush meals are savoured while reviewing the day's adventures with fellow travellers, your safari guide, chef and camp staff. Comfortable tented accommodation, including camp stretchers and bed linen/ towel in a 3m x 3m bow tent. En-suite Bathrooms – shower and bush loo. Licensed and experienced professional guide. Game drives and local transfers in customised safari vehicles. All entrance and camping fees within the National Parks & Reserves. Private camp sites, wherever possible. All Meals & Drinks: wine, beer, G&T, cool drinks, bottled water – no other spirits. Cook and Camp Assistant to do camp chores (staff will travel with guests in same vehicle). Our Namibian Explorer Expeditions are multi-night camping safaris that depart on a regular scheduled basis to the most beautiful wilderness regions of Namibia. This is the epitome of classic African style and comfort in tented travel – absolutely in a league of its own. We specialise in providing camping safaris with a great diversity of wildlife and landscapes, utilising private exclusive camping sites in National Parks and on private concessions. A journey to Africa is often life changing for our guests. We know that the most extraordinary way to truly experience Africa is by venturing into pristine, less-travelled areas. These Explorer Expeditions take guests closer to the soul and heartbeat of the continent than they ever dreamed possible. Glide past pods of hippos in the Okavango Delta. Walk through the awesome dunes in the sheltering deserts of the Namib, and thrill to the closest wildlife encounters in Chobe National Park. All our Namibian Expeditions are hosted by a professional, knowledgeable guide who shares a wealth of information gleaned from close interaction with the wildlife and ecology of the regions. Evenings are spent around a blazing camp fire, a parabola of stars above. Hearty, delicious bush meals are savoured while reviewing the day's adventures with fellow travellers, the Expedition guide, chef and camp staff. - Enjoy private camping, desert-chic style, in Namibia's exclusive wilderness areas on our exhilarating 13-day Safari. 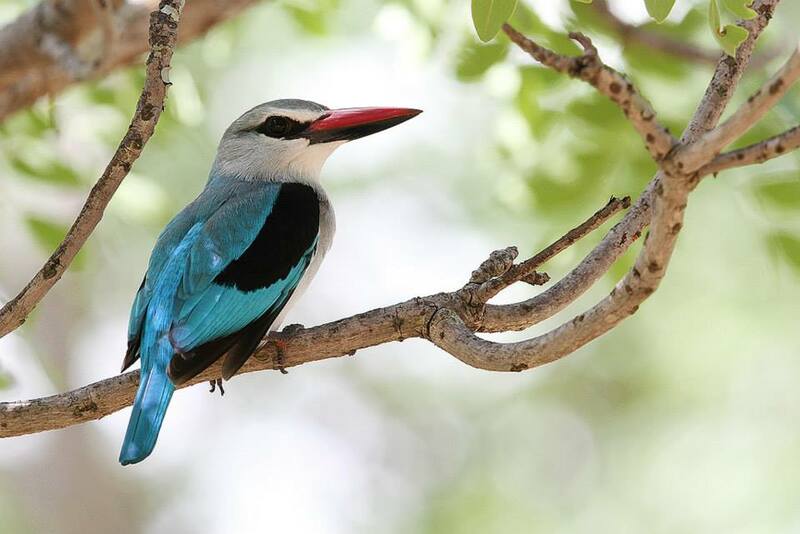 - Bush walks will reveal many endemic bird species and a chance of seeing desert-adapted rhino and elephant. - Eight nights fully serviced wilderness camping One bungalow and three hotel overnights (meals included). - Extraordinary game viewing in air-conditioned 4x4 safari vehicles Guide, chef and one camp/backup staff Maximum six guests – guaranteed window seat. All our mobile safaris combine old world hospitality with traditional luxury tented camps, home stays, and the best small safari lodges. We look after your every need from the moment you arrive till you depart. You are personally hosted from start to finish by experienced professional guides who act as both host and guide. All our camp sites are in beautiful settings, carefully chosen to be as private and wild as possible. A small private camp enables you to enjoy the true atmosphere of the real Africa at its best; evenings in genial company round a good fire under the stars listening to the noises of the night; the call of the scops owl, the roar of a distant lion. Enjoy the absence of civilisation, your own private paradise away from the crowds. Kenya's incredible and varied eco-systems: Meru, Buffalo Springs, the Rift Valley, Lake Nakuru & Bogoria and the Masai Mara * the big cats, flamingos, reticulated giraffe, gerenuk & grevy's zebra * a birder's paradise * private tented camps with top notch camp chef & local crew. Departures are for small groups with a maximum of 10 people, and personalized services is emphasized. A unique feature is that itineraries include private luxury camps set up in Samburu and Masai Mara. This is also a great way to go on safari as a family (Read more about Family Safaris). 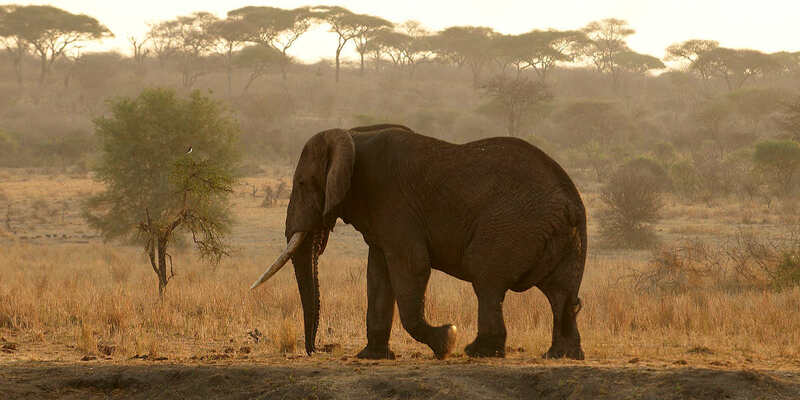 - Fly from Nairobi to Samburu Reserve, 3 nights in our private tented camp. Explore the Samburu, Buffalo Springs and Shaba Reserves. - Fly to Rift Valley, 3 nights at Gogar farm, Rongai. Day trips to Lake Nakuru Park, and Lake Bogoria National Reserve. - Drive to Maasai Mara, 4 nights in our private tented camp. Explore the Masai Mara, by 4WD vehicle and on foot. Fly to Nairobi. We offer luxury mobile camps that move around during the year so as to be positioned in the perfect spot for the game at any time of year. Being closer to the game concentration means less transit time to and from a distant lodge AND being right in the thick of it all day AND all night! Seasonally we put the camp in Tarangire National Park, Lake Manyara National Park, Ngorongoro and of course the Serengeti. The tents are walk in height with wooden framed beds, en suite toilet and shower and of course the bug proof mess tent and our great food! We keep the camp small as we need to minimise the impact on the environment – our camps are pared down to offer exceptional comfort but are still light enough to be transported by 4x4 Landcruiser. Camp Life .... mobile safari camps in Africa tend to be fairly grand affairs – totally unlike the family camping trips you did as a child. Our heavy canvas tents are airy inside and have sturdy wooden beds with warm duvets and pillows, each tent has a separate section at the back with a shower (hot water of course) and flushing caravan style toilet. There is also a shaded veranda on the front , somewhere to relax and take in the atmosphere. Meals are sumptuous feasts to be lingered over – waiter served in a roomy bug proof mess tent. Then of course there is the camp fire, the focal point of most camps, somewhere to relax with a pre-dinner drink and mull over the events of the day with your fellow travellers. There is something that stirs deep inside all of us as we draw closer to the fire, surrounded by the sounds of the African bush. Camps are about small numbers, about exclusivity – about the whole camp revolving around the pace and needs of the guests – from the wake up cup of tea or coffee in your tent then perhaps just a quick biscuit or piece of fruit and off out to see the tail end of the nights action or a full blown drawn out English breakfast - it's all about being flexible, and our leaders and guides are phenomenal at bending and twisting the itinerary to make the best possible fit for the weather, the wildlife and the guests. What you get .... all our camps are full board offering either 3 cooked meals a day or a fantastic picnic feast (we don't do the lunch boxes with the dried up cucumber sandwiches!). Every car carries a table and your guide will prepare a fresh salad to accompany the pizza, quiche or roast chicken from camp. Dinner in camp is a grand affair and we have worked hard to make the menu as varied and interesting as possible, we also include a local option on some night for clients to sample. Evening meals include beer, sodas and wine – and of course filtered drinking water is always available in camp. Whilst Zambia does not lend itself to the mobile tented safari concept, due the distances between its major national parks, we do have some mobile tented options in Zambia. The example below is but one. Others include mobile safaris in Kafue national Park and North Luangwa National Park. In selecting a mobile safari for you we will consider many options, depending on your circumstances, before selecting the most appropriate. If you are looking for a mobile tented safari through Zambia please complete the Start Planning form at the bottom of this page and tell us a bit about what you are looking for. On a similar theme to the traditional mobile tented safari we also offer what is called a "walking mobile safari", where guests walk between camps each day as the camp is moved and re-erected ahead. This has long been considered one of the best wilderness experiences in South Luangwa . After two nights at a lodge, the party drives to a wilderness area inh the north of the Park where they will walk for five days covering approximately 10km a day, following the Mupamadzi river. This clear river is a major tributary of the Luangwa . The area is remote and wild, the terrain and habitats varied and he game shy and unused to man. From ants to buffalo, a bird's nest to tracking a lion, you will learn the many facets of the bush. The fully serviced mobile camp is extremely comfortable and well-equipped with walk-in tents and full bedding. The shower is under a tree and the toilet is a bush loo with a wooden throne. Meals of a high standard are served under the open sky. A final three nights at one of our Luangwa camps or lodges completes the safari. Zambian Dawn Safaris, a fairly new safari operator in Zambia, has been offering classic tented mobile safaris through the remote wilderness of the northern Kafue National Park and southern reaches of the North Luangwa National Park since 2012. Both are six nights safaris and take guests into the wildlife rich, but under developed parts of Zambia's prime National Parks where there are currently few or no other tour operators. That's the beauty of being mobile. You will be amongst the first to experience this mid to high end mobile operation. All safaris will start on Saturday of each week and end on the Friday throughout the Zambian 'dry' season from April through to November. A traditional mobile tented safari should not be confused with the private vehicle + driver/guide safaris discussed under tailor-made safaris. As a general rule, a mobile tented safari is made up of either a private group/party, or more likely, a small group of individuals who have booked separately onto a set departure. In either instance, there will be no other guests in the mobile camp - outside of your own small group that is. With a private vehicle + driver/guide you will travel independently between camps/lodges but your accommodations will be shared with other groups/party's. Your mobile camp(s) are erected prior to your arrival and taken down on your departure and moved to the next location, where the same staff and equipment is there to meet you on your arrival. However, more and more safari operators are electing to leave the camp up for the season (generally 3 to 6 months) which then leads to other guests utilising any extra capacity in camp. The real distinction then, tends to lie in the style of the camp - temporary bush camp versus seasonally established safari camp. The difference may sound subtle, but for the purists the difference is significant. In the opinion of many; until you have experienced a true mobile safari you have not been on safari at all. - Access to remote wilderness areas. The mobility of the camp allows clients access to remote wilderness areas and enables them to visit a diversity of locations on one safari. - Traditional safari style. Follow in the footsteps of the first explorers and experience Africa in time-honoured safari style. Leave behind all reflections of modern life and journey back to the true essence of Africa. - Constant care of a private guide. Guests within the group are accompanied by a private guide for the duration of their safari, the benefit of which is that your guide soon gets to know your interests and needs and can build on them as you move from area to area. The knowledge and experience of the guide goes a long way to enhancing your safari experience. - Exclusivity. While on safari guests are assured complete exclusivity. Each safari is tailor-made to accommodate the personal tastes and interests of individual clients. - Proximity to nature. Fall asleep to the calls of the wild and wake up to the warmth and light of the African sun streaming through your tent. Awaken your senses with the smell of first rain, soothing African breezes and breath-taking sunsets. 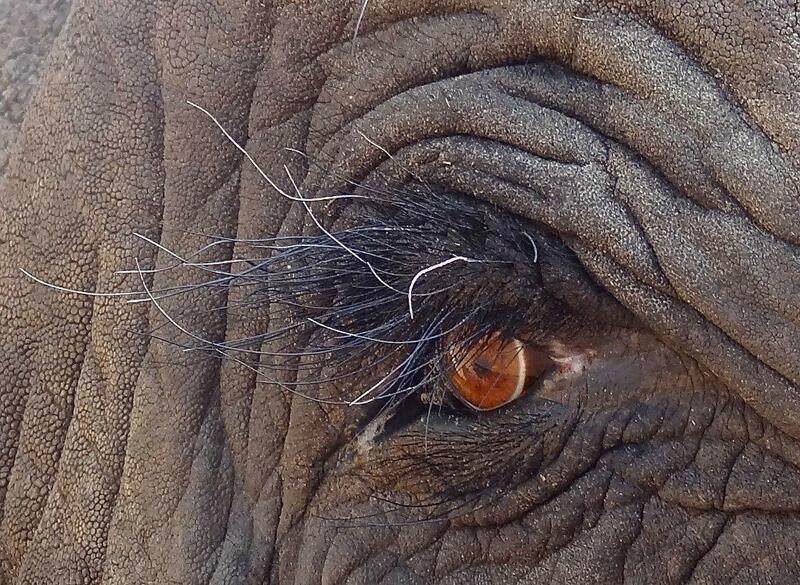 A mobile safari allows you to get up close and personal to the miracle of nature. Exhilarating! - Comfort. The term camping safari often conjures up images of bad food, dirty clothes and daily discomfort. This is a common misconception. An expedition into the African bush does not mean that guests must forego certain comforts. A serviced safari offers the promise of comfortable beds, fine cuisine and personal service. - Back to basics. There is something magical about the atmosphere created by the soft, warm glow of a lantern and showering under a starry night sky with a steaming bucket full of water warmed by the campfire. Going back to basics is part of the experience. 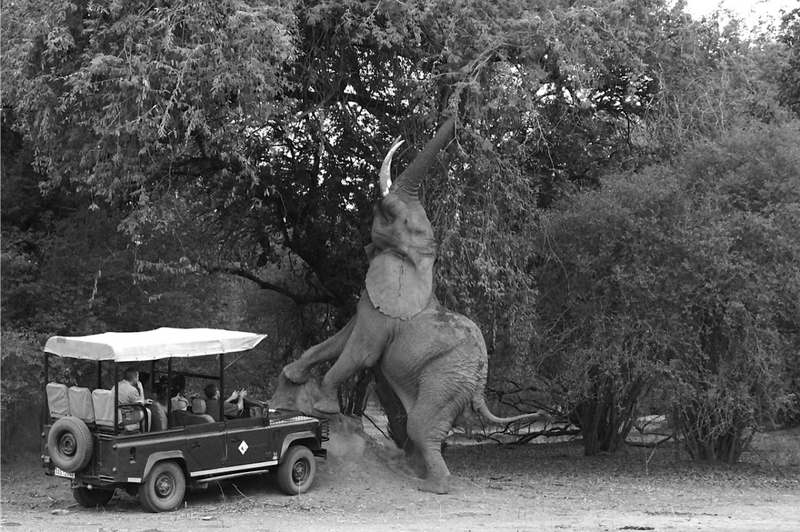 This is probably the most exciting way to do a safari in Africa, and perhaps the only truly authentic safari style. NB: It is often thought that mobile tented safaris would, by extension of them being a camping safari, be cheaper than a permanent lodge or safari camp. This is not necessarily the case, and where the mobile safari is on the luxury side, they can be considerably more expensive. This is because, in the main, you are travelling as a private group with your own private staff and equipment - all of which must be set up on your arrival and packed up on your departure. The logistics and re-supply of such an operation do not necessarily lend themselves to good economy. We also offer some fantastic "overland" camping tours throughout southern and east Africa ranging from 10 to 27 days. We have selected only reputable operators with proven track records in providing reliable vehicles and good guides at a reasonable price. Get in touch.